Pears are the long-lived giants of the fruit tree world. Ours are on full-sized OHxF 97 rootstock. Pears are self-unfruitful, so require another variety nearby for pollination. 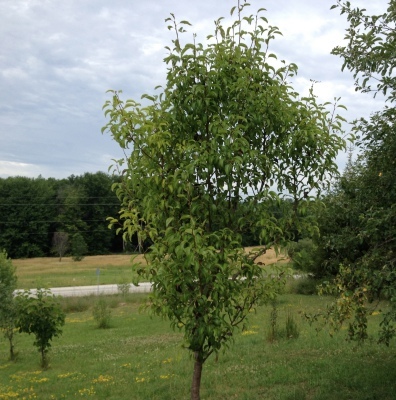 Bartlett – The most highly cultivated pear in Ontario, for good reason; it’s very productive and has delectable flavour. Golden Spice – Another very cold-hardy variety that bears small, yellow fruits with a sweet, spicy flavour. Resistant to fireblight. Harrow Delight – This pear was bred in Ontario; the flesh is sweet and juicy, and it’ll keep for about a month. It’s resistant to fireblight and pear scab.